I was recently sent Kai-Lan's Great Trip to China DVD to review and we have really been enjoying it. 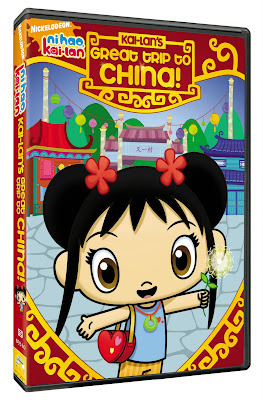 Synopsis: Join Kai-lan and her friends Rintoo, Tolee and Ho Ho in an adventure-filled, fun and educational trip to China in this exciting double-length feature episode. Kai-lan gets a phone call from her favorite great aunt (and YeYe’s sister), Gu nai nai, inviting us to come to China and meet a baby panda! During their journey, Kai-lan and her friends are amazed by all the new things that they see. This playful and upbeat show introduces Mandarin Chinese in a fun, interactive way, also helping children to develop emotional and social skills. I really like Kai-Lan and so do all three of my kiddos! It has been fun listening to them try and repeat the Chinese phrases Kai-Lan teaches. The DVD also has some great lessons like trying new things and considering the needs of others. The point is always very clearly made so it is easy for kids to understand. I would definitely recommend Kai-Lan! I have a friend who has adopted two Chinese children. This would be a fun video for them.